The first disc in this three-disc set is the Blu-ray containing the 'All The Colors of Giaillo' documentary directed by Federico Caddeo. The genre-defining doc has interviews with many of the taste makers who made this stylish genre what it is, we get interviews from directors Fabio Melelli, Lamberto Bava, Sergio Martino, Dario Argento, Lucio Fulci, Luciano Ercoli, and Umberto Lenzi, stars Daria Nicolodi, George Hilton, Barbara Bouchet, Nieves Navarro and Edwige Fenech, and screenwriters Ernesto Gastaldi and Dardano Sachetti. 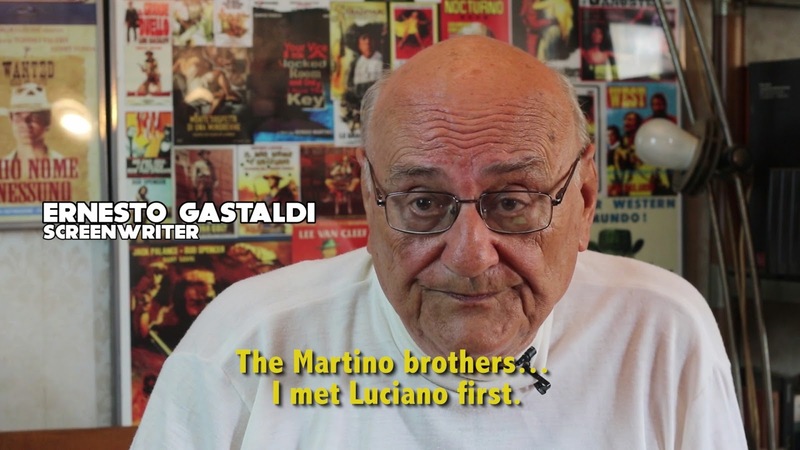 Most of these look like they were recorded new for the doc, while others are more vintage, these being Lucio Fulci (who appears in an audio interview) and Nieves Navarro who are sadly no longer with us. 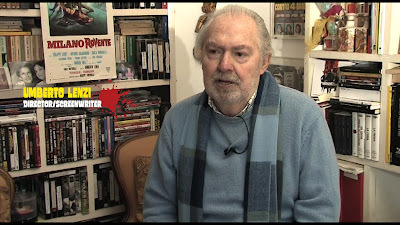 The doc does a good job tracing the origins of the giallo from American noir to German Krime films, touching on their literary origin in the novels of Edgar Wallace, whose yellow covers gave the genre it's name. I've been watching extras for giallo films for over a decade, there wasn't a whole lot of revelation in this doc for me but I still enjoyed the stories about the making of these stylish films from the mouths of the major players involved. 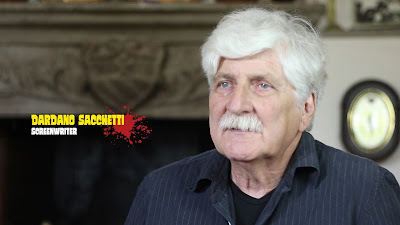 The doc is primarily in Italian with English subtitles, loaded with talking heads, and clips from the films, with lots of images and movie posters throughout. This thing never gets dull, if you're a fan of the Italian whodunits this is an essential watch. Aside from the great doc Severin have gone all-out for extras on this release, beginning on the Blu-ray disc with a gigantic four-hour 'Gialothon' of 82 film trailers! 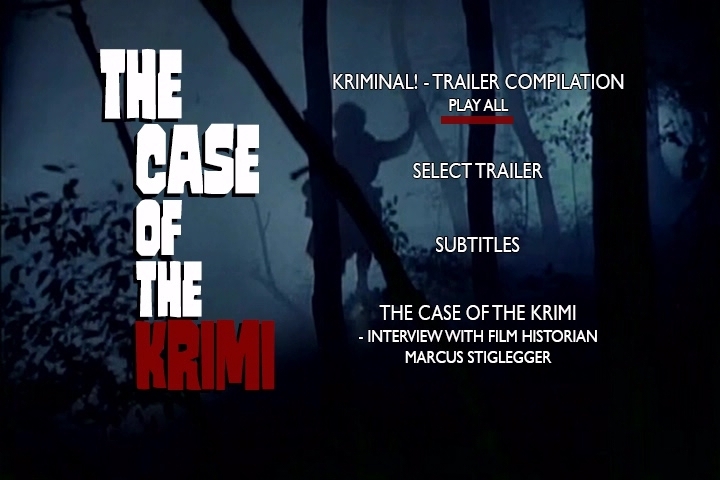 The doc is pretty damn good but for me this is the most desirable part of the package, most of the trailers are in English and presented in widescreen HD, with optional audio commentary from Kat Ellinger, Author of All The Colors Of Sergio Martino, on every single trailer! It is always a delight to hear Ellinger speak about genre films, she does admirable work cramming quite a bit of info and appreciation for each film into a 2-4 minute run time for each trailer. 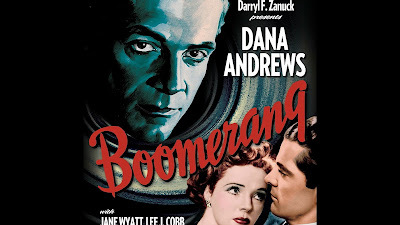 The quality of the trailers varies a bit from title to title, but I never found any of them to be less than watchable. I am not one to be super picky about the video quality of trailer compilations, but I think what we get here is for the most part very good quality. 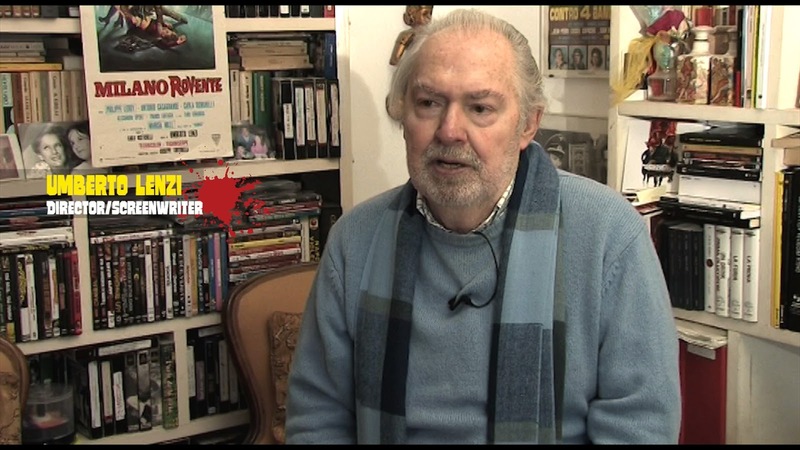 Also on the Blu-ray disc is 'The Giallo Frames' a 20-min interview with John Martin, Editor of The Giallo Pages, a wealth of knowledge about the genre is crammed into this one, it's a very cool extra. Moving onto disc 2, the DVD, we have a 23-min interview with film historian Marcus Stiglegger who speaks about the German Krimi films that inspired giallo cinema. 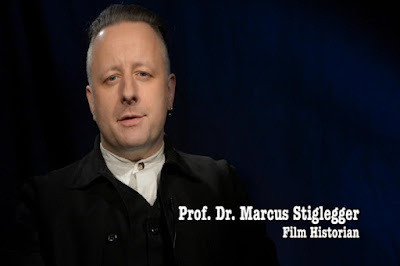 He traces the origins of the genre from the writings of Edgar Allen Poe and sir Arthur Conan Doyle on to British author Edgar Wallace and the German expressionist cinema movement and beyond. This interview is in English. 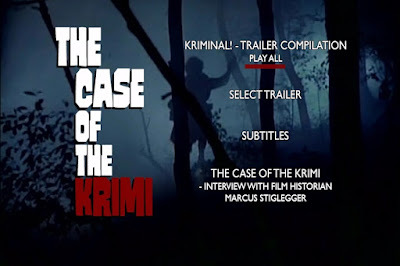 This is followed-up with 91-min of Krimi trailers, totalling 32 in all! These trailers can be played all at once or you can select a trailer. Last, but certainly not least we have the third disc, a soundtrack compilation CD 'The Strange Sounds Of The Bloodstained Films' - twenty tracks of music from giallo cinema compiled By Alfonso Carillo of Rendezvous! from the archives of Beat Records. This swanky compilation features choice cuts from Riz Ortolani, Ennio Morricone and Bruno Nicolai among others a fine selection from seminal giallo films. 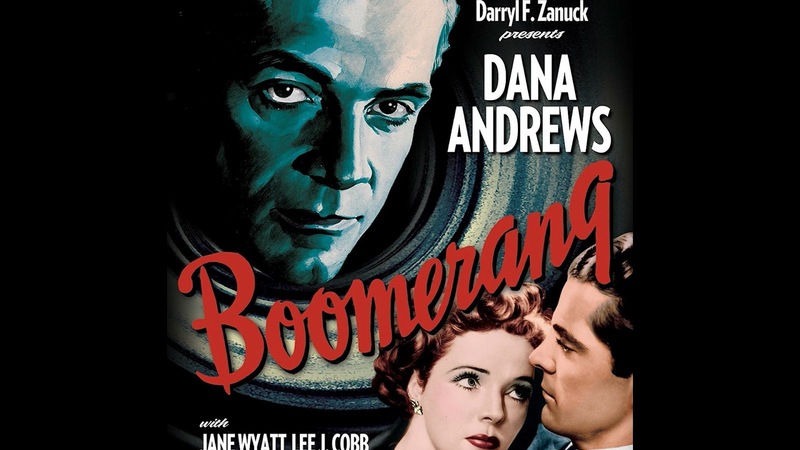 This 3-disc Blu-ray/DVD/CD release is region-free and comes housed in a spiffy looking black Blu-ray keepcase with a one-sided sleeve of artwork. Inside the keepcase you will find the three discs plus a glossy index-card sized track listing form 20-song 'The Strange Sounds Of The Bloodstained Films' compilation. 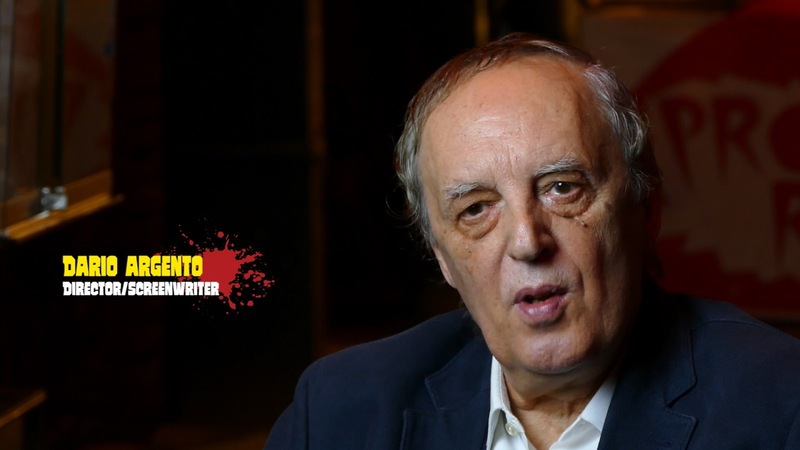 - The Strange Sounds Of The Bloodstained Films: Compiled By Alfonso Carillo of Rendezvous! From The Archives Of Beat Records, remastered By Claudio Fuiano. 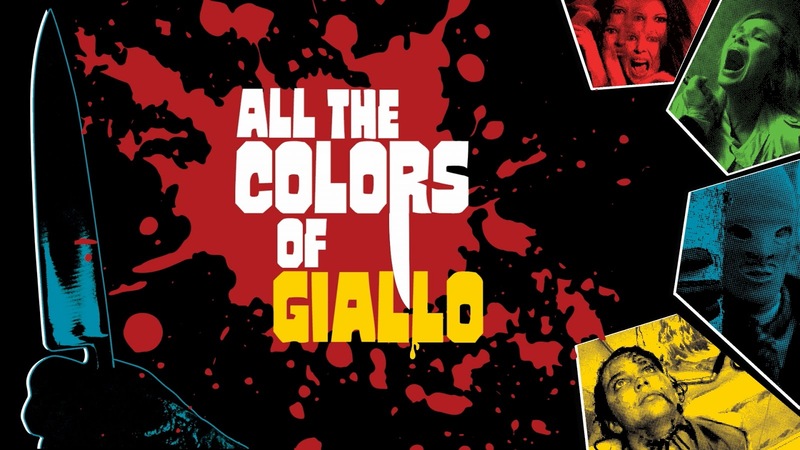 For fans of giallo cinema this is a comprehensive and exhaustive set of black-gloved love, it took me days to pour through everything, and the CD has been in heavy rotation in my car all week long, it's a pretty swank listen, highly addictive. Revised review, erroneously listed the lovely Edwige Fenech as deceased, she is not, still very much alive.